Beauty in nature is found everywhere. With bright blue skies, romantic breezes and picturesque sunsets. When planning an outdoor wedding, it’s important to consider various aspects to ensure that the wedding is perfectly captures nature’s beauty. At the Manor, we offer 20 acres of manicured landscape, and a beautiful selection of formal gardens with trellises and an open-air gloriettes. Our wedding planners have gathered ideas and advice to ensure your outdoor wedding is stunning! One of the most important aspects when planning an outdoor wedding is preparation for all types of inclement weather, whether it is a rainy wedding day or a chilly breeze. It’s important to invest in a tent in case of rainfall; you will be able to make the call early in the day. It’s also essential to provide air-conditioning or portable heat depending on the temperature that day, allowing guests to feel comfortable. Natural sunlight makes for great pictures; but, too much sunlight is never fun. Providing areas for shade will keep guests happy and the bridal party looking flawless. It is also courteous to offer a program that doubles as a hand fan, personalized water bottles for hydration as well as fancy shawls in case of strong winds. These ideas will creatively provide weather accommodations to guests while seamlessly fitting into the theme of your outdoor wedding. Everyone enjoys a good party and the dining experience is an anticipated part of your wedding reception. Our wedding planners work closely with couples and caterers to plan a decadent and appealing menu. Our caterers provide outdoor friendly options that keep each course at the proper temperature no matter what the weather. Also, just as the weather can change, so can menu options. For example, guests can cool off with refreshing beverages such as lemonade or chilled desserts for hotter weather, whereas hot drinks such as tea and warm soup warm them up on colder days. Depending on the wedding theme, a barbeque dinner and ice pops creates a simple, yet comfortable feel to a hot summer wedding. Nature’s beautiful décor is the greatest advantage to an outdoor wedding. 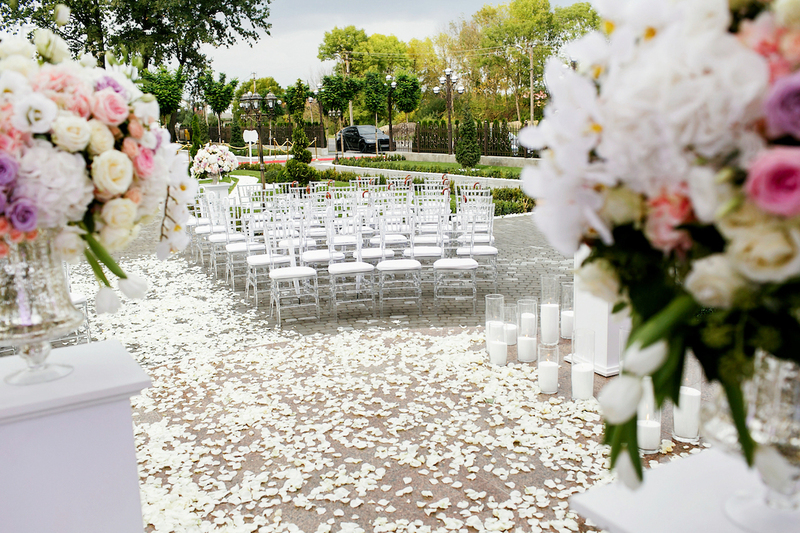 With flowing fountains striking waterfalls and a beautiful assortment of flowers and vast greenery, the Manor’s picturesque outdoor venues surrounded the breathtaking landscape of Eagle Rock Reservation. Decorations added to an outdoor venue should typically provide simplicity and balance, as well as effortlessly provide accommodations for the outdoors. For instance, stringing LED lights and hanging lanterns create a whimsical feel that provides subtle lighting in daylight as well as the evening. Also, flower petals and stepping-stones can help create a path for guests through the wedding from the food to the reception area. Our wedding planners can help plan for the necessary extra aspects of an outdoor wedding. To be considerate of the bridal party and guests, consider providing a hair and makeup touch up station. It is also important to have luxurious restrooms nearby. Signs are important for an outdoor wedding and should be incorporated to direct guests to the locations of restrooms, the bar, and other stations. Additionally, proper wiring and electricity must be provided for DJs/bands and speakers. While an outdoor wedding looks breathtaking in photos, The Manor can create a dream wedding all your own with proper planning. Creating an outdoor wedding can also be a way to personalize through creative ideas that can benefit your guests. Our wedding planners at the Manor will work closely with each couple and vendor to ensure your guests can feel the love in the wonderful outdoor air. This entry was posted on Wednesday, April 26th, 2017 at 2:34 pm	and is filed under Outdoor Venue, Outdoor Wedding, wedding planning. You can follow any responses to this entry through the RSS 2.0 feed. Both comments and pings are currently closed. To make an appointment with a banquet manager, please contact us at 973-731-3100.